Cowboy Little and Cowboy Small like adventures even more than Sunday dinner with fried chicken and Mama’s blue-ribbon apple pie. Every chance they get, they climb on their horses Ned and Ted, round up their dogs Red and Fred, their fleas Itch and Scratch, and their cattle Brawny Bull and Helen Heifer, and head out beyond the fences of Circle R Ranch. 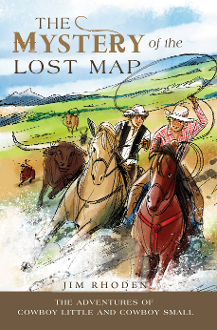 When they find old saddlebags filled with gold coins and a strange map, they set out to solve the mystery. On the way, they face bandits, Indians, and bats.